Geothermal is an energy-efficient, cost effective space conditioning system that taps into the earth to capture its renewable energy. The earth absorbs the sun’s energy that reaches it, storing that energy in the ground. 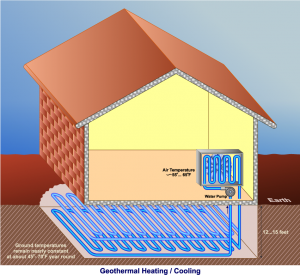 A geothermal system extracts that energy for heating during winter. For cooling, the system removes heat from the home and dumps it into the cooler earth. This transferring of heat is accomplished using a series of pipes buried deep in the ground. Not only is a geothermal system a renewal energy source making it highly energy-efficient, it requires no outdoor unit and is quiet, reliable and durable. Answering a couple of these questions might mean that geothermal is right for you. Does your home have at least 2500 sq. ft of conditioned space? Do you feel good about using high heating and/or cooling efficiency? Is the current heating or cooling system 15 yrs. old. or more? Does your average summer temperature get above 85° or higher? Does your average winter temperature drop to 32° or lower? Do you have a large yard that could facilitate digging in a system? Do you plan on being in your home 10 yrs. from now? Do you want to eliminate the outdoor unit? Top 10 Reasons to Choose Geothermal? Higher energy efficiency means lower operating costs. If utility rates increase 5% per year nationally, a dollar spent today in utility bills will be $2.53 in 20 years. A Bryant geothermal system is specifically designed for your home with the aid of computer software and the experience of your Bryant dealer. Bryant geothermal equipment may have longer life expectancy because it’s underground and inside the home, without exposure to weather conditions. Since it is run by electricity, there are no furnace flue pipes, penetrations in the roof for exhaust, or risks associated with having a combustion system inside the home. Bryant geothermal technology includes environmentally sound Puron refrigerant. Bryant limited warranties are among the best in the industry. You may be eligible for a 30% tax credit on the installation cost of a geothermal system, with no maximum.